While I get into this stuff sometimes for fun, in truth I am not superstitious — so in no way did I interpret this as “meant for me.” But regardless, it was incredibly applicable to me, and I loved the way I felt when I read it. It’s as if a soothing voice was whispering to me, It’s okay to go slowly. This is what works best for you. I’ve displayed this note in a variety of places since I received it… desks at work, bathroom mirrors, above the stove, etc… and it’s been a good reminder in all of them. A couple of years ago, it found its permanent home in my sewing studio, and it never has been more appropriate. When I try to speed up my sewing, compare my output to others, or put pressure on myself with deadlines, I promptly stop having any fun. Plus, the mistakes begin to compound. All of this is to explain the following. When I say a sewing project is “fast,” that means most sewists could probably complete it inside of a commercial break. This one took me about two hours start to finish, and I don’t even make tote bags that quickly. I initially purchased this pattern for the pants in view A, which I have not yet made. Last year, I bought some RTW double knit pants with a fold-over waistband, and I have worn the shell outta them. So I knew that I intended to use this pattern to replicate that style, without the ruching in the design. 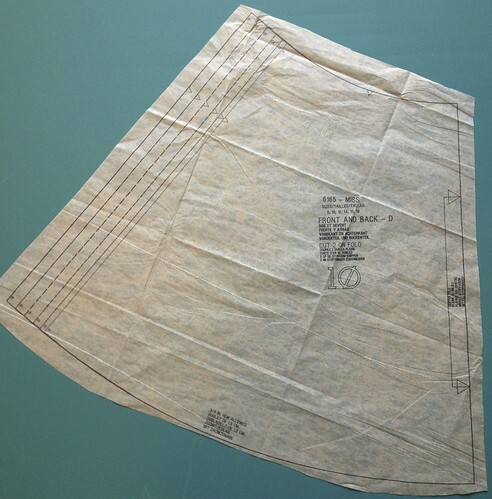 The pattern is printed for hip measurement 31″-49″, so I needed to grade up a little. Actually, I added more than my measurements dictated, because the pattern is designed for jersey or lightweight double knits with 50% stretch (according to the Pick-a-Knit ruler). This ponte is very stable and doesn’t stretch much despite a little spandex content, so I added a bit of design ease as well. 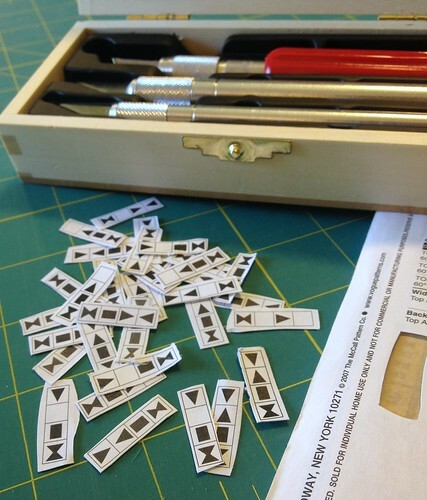 This is the easiest pattern to grade, ever. The waistband is just a rectangle, and the front/back skirt piece literally just extends the side seam… see? So zip zap grading done. Cut. Sew. Finished. I didn’t even hem it. I have a little more to say about this make, though not about the construction or pattern itself. 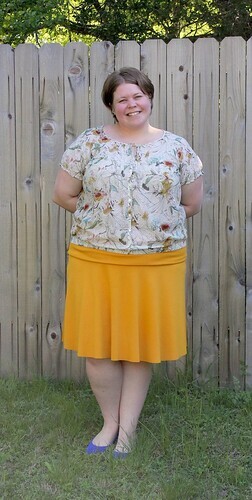 The finished product was exactly the design I had envisioned — fold over waistband, partial circle skirt, lovely color, exceedingly comfy — but as soon as I put it on, I knew that it wasn’t the most flattering look for me. Lines and extra bulk around the largest part of my body. Bright color on my lower half. The list of rules I was breaking was long. I felt deflated, because I loved the skirt! Then when I woke up this morning, this post from Steph (site no longer available) was in my reader: “Not Buying It: Styles for Body Shapes.” I have sung myself quite similar tunes in the past, but somehow I had forgotten it this time. It was just what I needed to remember today. I had found my eyes gravitating towards those damn shapes every time, and the thing is, I started to get pissed off whether my shape was shown or not. If it wasn’t shown, I was defiant and felt I had to prove something. When it was shown, I felt I had been granted permission and that made me upset at myself. I didn’t even agree with it half the time anyway! Who needs that kind of provocation?? I can’t tell you how freeing it was to cut them out. Now, even when I browse the new releases on the Vogue website, I do so with an attempt to keep my finger over those shapes, so that I can decide whether I like or want the pattern exclusive of that input. Maybe one day I’ll find that I don’t react so fiercely to those shapes, instead interpreting them just as someone’s opinion with which I may or may not agree. But today, I’m not there yet, and this is what works for me. Susan, my reaction to this post is kind of ironic. When I saw the opening photo, the first thing that I thought was “damn, that is a style I typically avoid but Susan is rocking it! Must rethink my avoidance of fold over waistbands.” The thing is, after reading sewing and personal style blogs for so many years now, I have totally gotten over tht whole “flattering is the most important aspect of clothing” thing. Some bloggers adhere to this rule, but the ones that really look confident and like they are having a damn good time living their lives don’t seem to care whether what they wear is flattering or not! I think that the most important thing in clothes is that they express to the world how you feel about yourself and what kind of person you are. and i’d hate for the world to think that all i have to offer is “flattering”. so, this skirt checks all the boxes for me- comfy, practical, remixable, fun, and cute! Nice work! OMG, no kidding it was fast. You only bought that fabric on Saturday night!! I have never seen you turn around a fabric purchase so fast! So glad I could be a small part of your inspiration. And I totally agree with Megan – you are rocking this skirt. It is fabulous and you look great in it. I love how it falls especially from the back. It looks like it would swish prettily when you move and what woman does not like that. Great move not hemming it – that will keep the swish. Best of all is your happy smile! Thanks sweetie! It’s by far the fastest turnaround for sure. :) And yes, it’s quite swishy and I love that about it!! Great skirt – fabo colour and great look for you. Found your blog via Steph and I’m so glad she posted it. It’s nice to see other non-“regular size” sewing bloggers! 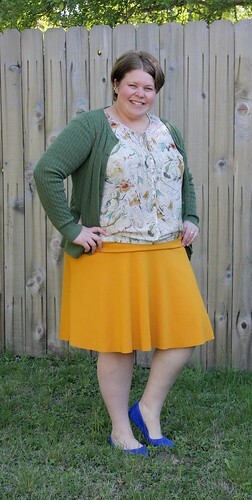 Also, I need this pattern… those knit skirts come in handy in Texas summers, right? Lovely, Susan. This post makes me so happy. Such a sweet skirt, and just perfection with the blue shoes. I had a similar reaction to Megan – my first thought was, “How cute! That looks great on Susan!” I especially love the second outfit, with the print top. I agree with you completely on everything else – life is too short! Wear what makes you happy! First up…that skirt is to die for. It’s absolutely perfect and the colour is amazing! Secondly…I DESPISE the little rectangle thingies on Vogue patterns. My absolute favourite dress is one that according to the Vogue Fashion Police I’m the ‘wrong’ shape to wear. B*****ks! I get more compliments in that dress than anything else I wear. I’m sick of the dialogue that we’re too fat, too tall, too thin, too whatever to be the fabulous, talented, beautiful, stylish women we are. I’m normally one of those RSS lurkers, but the black and turmeric? That looks great on you! Following the ‘rules’ in most things gives us confidence and reasonable successes while we build our skills. Breaking those rules, especially when they chafe, is a big part of how we find our own voices and styles. Thanks for delurking, Stormie! This is such, SUCH a great point. Love it! Found your blog thru your review on PatternReview. Cute, cute skirt & love the color! I think you look fantastic in it! Love your attitude too. I think your skirt is rad. How great are simple knit skirts?? I just made one, myself, and I think they’re better/more comfy than yoga pants… I love the bright yellow with the blue, what fun! Indeed! You’d think they would hold focus groups or something. ;) You know, I think this may be the first knit skirt I can remember having. I want to live in them! I’ll have to try the Pavlova next! Thanks, Steph. What a wonderfully positive and self affirming post. I salute you! Way too funny! I had no idea what those little shapies were for ether. We just plain don’t need them, so Vogue might as well save ink money. I love your attitude…you made my day, so thank you! I love the color of your skirt, it hangs so perfectly and looks beautiful on you!!! Susan! In a skirt! It looks great on you, and the drape is so beautiful–great job. I love the color too! 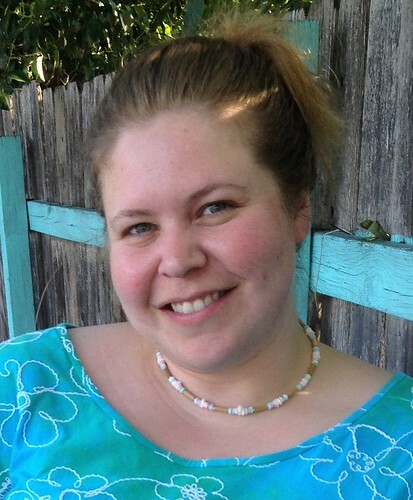 Love your blog, Susan, and I’m definitely inspired to sew! What a beautiful post AND skirt! Big hugs to you, sis…I am so proud of you! Thanks Judy… MWAH! And no kidding, they really DO go with everything, like for real! Susan, I have only just discovered your blog and am zooming along looking at past posts when I saw this one and had to remark. I hope that you are still, a year later, wearing that skirt because it is lovely and you wear it beautifully! The message in this post is one of my own soapboxes as well. The smile on your face and the lift of your chin is far more flattering than anyone’s idea of what you should and shouldn’t wear. I’ve enjoyed reading about your makes, not the least of which because there are no apologies. So often we apologize about wanting to make pretty things, because we don’t “look right”. And yet, what shall we do? Go about in ugly things until we die because we have a certain shape? So keep sewing! And perhaps you have inspired me to get back to my underused blog and post a few of my brand-new-sewist makes!